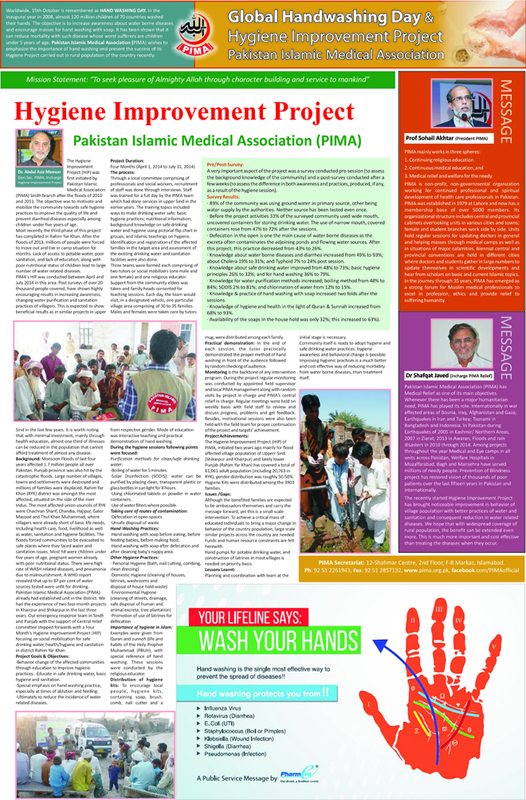 The Hygiene Improvement Project (HIP) was first initiated by Pakistan Islamic Medical Association (PIMA) Sindh branch after the floods of 2010 and 2011. The objective was to motivate and mobilize the community towards safe hygiene practices to improve the quality of life and prevent diarrheal diseases especially among children under five years of age. 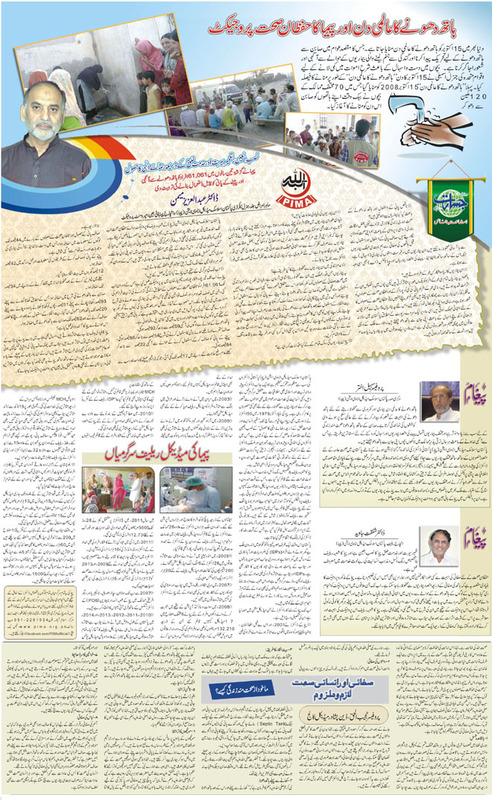 Most recently the third phase of this project has completed in Rahim Yar Khan. After the floods of 2013, millions of people were forced to move out and live in camp situation for months. Lack of access to potable water, poor sanitation, and lack of education, along with poor nutritional status of children lead to large number of water related diseases. 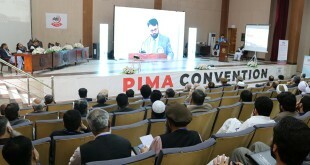 PIMA’s HIP was conducted between April and July 2014 in this area. Post surveys of over 20 thousand people covered, have shown highly encouraging results in increasing awareness, changing water purification and sanitation practices of villagers. This is expected to show beneficial results as in similar projects in upper Sind in the last few years. It is worth noting that with minimal investment, mainly through health education, almost one third of illnesses can be reduced in the population that cannot afford treatment of almost any disease. Background: Monsoon Floods of last four years affected 1.7 million people all over Pakistan. Punjab province was also hit by the catastrophic floods. Large number of villages, towns and settlements were destroyed and millions of families were displaced. Rahim Yar Khan (RYK) district was amongst the most affected, situated on the side of the river Indus. 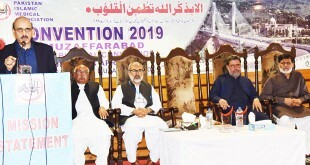 The most affected union councils of RYK were Chachran Sharif, Chandia, Hajipur, Galor Masood and Thul Khair Muhammad, where villagers were already short of basic life needs, including health care, food, livelihood as well as water, sanitation and hygiene facilities. The floods forced communities to be evacuated to safe places where they faced water and sanitation issues. Most hit were children under five years of age, pregnant women already with poor nutritional status. There were high rate of WASH related diseases, and pneumonia due to malnourishment. A WHO report revealed that up to 87 per cent of water sources tested were unfit for drinking. 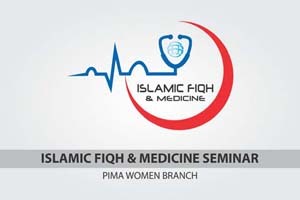 Pakistan Islamic Medical Association (PIMA) already had established unit in the district. We had the experience of two four-month projects in Khairpur and Shikarpur in the last three years. Our emergency response team in Sindh and Punjab with the support of Central relief committee stepped forwards with a Four Month’s Hygiene Improvement Project (HIP) focusing on social mobilization for safe drinking water, health/hygiene and sanitation in district Rahim Yar Khan. Behavior change of the affected communities through education to improve hygienic practices. Educate in safe drinking water, basic hygiene and sanitation. Special emphasis on hand washing practice, especially at times of ablution and feeding. Ultimately to reduce the incidence of water related diseases. Through a local committee comprising of professionals and social workers, recruitment of staff was done through interviews. 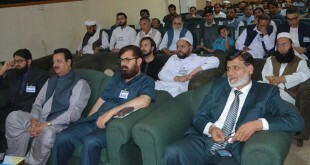 Staff was trained for a full day by the PIMA team which had done services in upper Sind in the earlier years. The training topics included ways to make drinking water safe; basic hygiene practices; nutritional information; background knowledge on safe drinking water and hygiene using pictorial flip chart in groups; and Islamic teachings on hygiene. Identification and registration of the affected families in the target area and assessment of the existing drinking water and sanitation facilities were also done. Three teams were formed each comprising of two tutors or social mobilizers (one male and one female) and one religious educator. Support from the community elders was taken and family heads consented for teaching sessions. Each day, the team would visit, in a designated vehicle, one particular village area comprising of 30 to 35 families. Males and females were taken care by tutors from respective gender. Mode of education was interactive teaching and practical demonstration of hand washing. Boiling of water for 5 minutes. Solar Disinfection (SODIS): water can be purified by placing clean, transparent plastic or glass bottles in sun light for 8 hours. Using chlorinated tablets or powder in water containers. Use of water filters where possible. Hand washing with soap after defecation and after cleaning baby’s nappy area. Examples were given from Quran and sunnah (life and habits of the Holy Prophet Muhammad (PBUH), with special reference of hand washing. These sessions were conducted by the religious educator. Distribution of hygiene kits: To encourage local people, hygiene kits, containing soap, brush, comb, nail cutter and a mug, were distributed among each family. Practical demonstration: In the end of each session, the tutor practically demonstrated the proper method of hand washing in front of the audience followed by random checking of audience. Monitoring is the backbone of any intervention program. During the project regular monitoring was conducted by appointed field supervisor and local PIMA management along with random visits by project in charge and PIMA’s central relief in charge. Regular meetings were held on weekly basis with field staff to review and discuss progress, problems and get feedback. Besides, motivational sessions were also been held with the field team for proper continuation of the project and targets’ achievement. Pre/Post-Survey: A very important aspect of the project was a survey conducted pre-session (to assess the background knowledge of the community) and a post-survey conducted after a few weeks (to assess the difference in both awareness and practices, produced, if any, as a result of the hygiene session). The results are shown later (see below). 89% of the community was using ground water as primary source, other being water supply by the authorities. Neither source has been tested even once. Before the project activities 33% of the surveyed community used wide mouth, uncovered containers for storing drinking water. The use of narrow mouth, covered containers rose from 47% to 72% after the sessions. Defecation in the open is one the main cause of water borne diseases as the excreta often contaminates the adjoining ponds and flowing water sources. After this project, this practice decreased from 43% to 26%. Knowledge about water borne diseases and diarrhea increased from 49% to 93%; about Cholera 19% to 31%; and Typhoid 7% to 24% post session. Knowledge about safe drinking water improved from 48% to 73%; basic hygiene principles 26% to 32%; and for hand washing 36% to 79%. Knowledge for water purification methods increased; boiling method from 48% to 84%; SODIS 2% to 81%; and chlorination of water from 12% to 15%. Knowledge & practice of hand washing with soap increased two folds after the sessions. 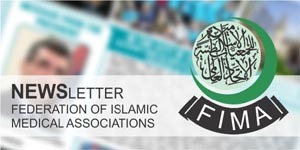 Knowledge of hygiene and health in the light of Quran & Sunnah increased from 68% to 93%. Availability of the soaps in the house hold was only 32%; this increased to 63%).